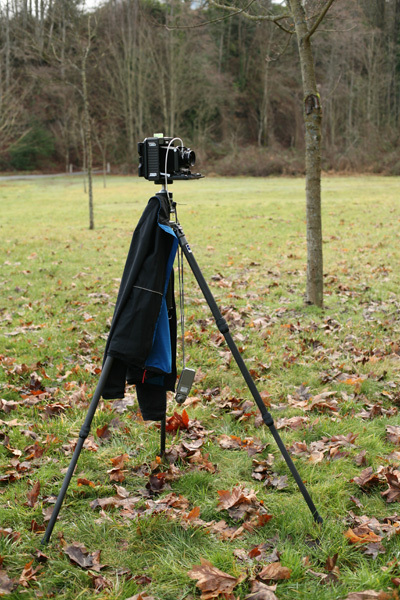 I started out Saturday, February 9, 2007, to find some photo ops with the 4x5. I had 5 film holders of T-Max loaded and ready to expose. I had a list of places I wanted to look at and likely shoot, but alas life got in the way. After getting my venti mocha to keep the brain going, I went to the first place. All the parking spaces in front were taken and I wanted a clear view of the tavern (not out of business). Ok, onward. The second place was in shade from the overcast skies, and everything was washed out. The third place turned out to be dull. Anyway, off to a cafe to sit and think. Ok, I forgot to add something. Since the 180mm f5.6 Schneider Symmar-L lens doesn't fit the Horseman, the rear group is too large for the bellows, I bought two used lenses from KEH, a favorite source of good used equipment, a Symmar-S 150mm f5.6 and a Symmar-S 210mm f5.6. These fit the size 0 and 1 lensboards and camera. Back to the story. About an hour later I went back to the second site, a small valley, the second choice before. The skies had partially cleared between a thin layer of clouds. This provided a nice even, slightly diffused light. You can see the setup in the photo above. The coat is simply for the chill, and does make a good dark cloth if I needed one, but I've discovered I haven't needed a dark cloth. My rodenstock 4X Loupe works well. It has a focus adjustment and a slide light cover for viewing slides/negatives or prints, and sliding the light cover down keeps the circular image on the screen dark enough to focus. 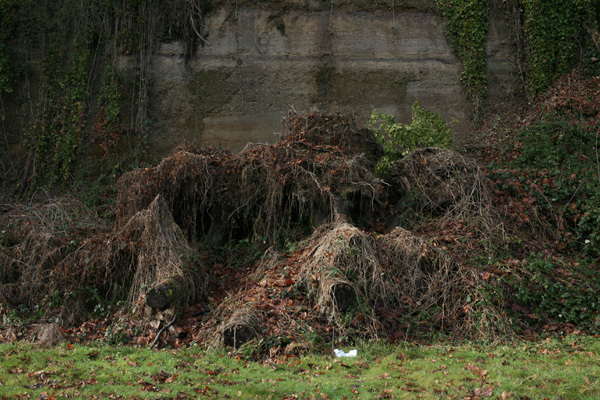 And so I set up to photograph this recent small landslide. Nothing fancy, just an exercise in learning the camera, exposure, and process. I focused on the small clump of green leaves in the middle right of the image (from the Canon 5D). Yes, I removed the white plastic baggie, I used it to reference the 4x5 image. I'm finding viewing the ground glass with the upside down and backward image easy to adjust to, even without reference point, but I used the baggie to comare the 5D and 4x5 image. The exposure settings I used were f45 at 1 second and f11 at 1/15 second to see the difference in the depth of field with the 150mm f5.6 lens. So after wandering around for a new site to photograph, and not finding an interesting one, I packed up and wandered down Ruston way, but didn't get to far, see part II.